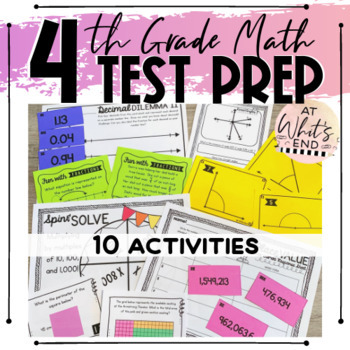 My TEST PREP for 4th grade math is the perfect addition to your class! These 10 stations serve the dual-purpose of being a fun way to review and freshen up skills learned earlier in the year, and they are also great for TEST PREP for your upcoming state testing! These stations are for test prep and beyond! All stations are printer-friendly and use mainly black ink to print! Be sure to check out the in-depth preview of this product by clicking the button below! Check out the preview for an in-depth look! 10 stations/activities ALL including STATION DIRECTION PAGES for easy use to set up stations in your classroom! -LINES & ANGLES BOOK: This nine-page book can be used in a variety of ways in your classroom. Students can take notes, review their knowledge, or use it as for an assessment grade! Three tasks included for assessing student knowledge. -PLACE VALUE: Students will review place value to the tenths and hundredths place. They will also work with standard, expanded and word form. -ANGLE PRACTICE: Using the task cards, student make predictions on what type angle they see. Students then measure to classify angles as acute, obtuse, or right. -DECIMAL DILEMMA I: Students will take the 24 decimal cards and write the decimals as a fraction or mixed number. -DECIMAL DILEMMA II: Students will pick four decimal cards to place on number lines, showing what they know! -DECIMAL DILEMMA III: Students will order the fraction cards from least to greatest and record on the response sheet. -ELAPSED TIME: Babysitter Alice has been keeping a time log of her monthly babysitting jobs. Students will help Alice complete the time log! -FUN WITH FRACTIONS: 12 task cards and a response sheet. Questions over composing and decomposing fractions, fractions on a number line and finding simplest form. -AREA AND PERIMETER: 12 task cards and a response sheet. If 12 cards aren't enough for what you need, check out my Perimeter and Area set of 24 task cards in my store!! Due to TOU on graphics and digital background papers, the actual colors and graphics embedded in the file cannot be changed. Please ask any questions you have about the file, prior to purchasing. Due to the nature of digital files, no refunds are available.